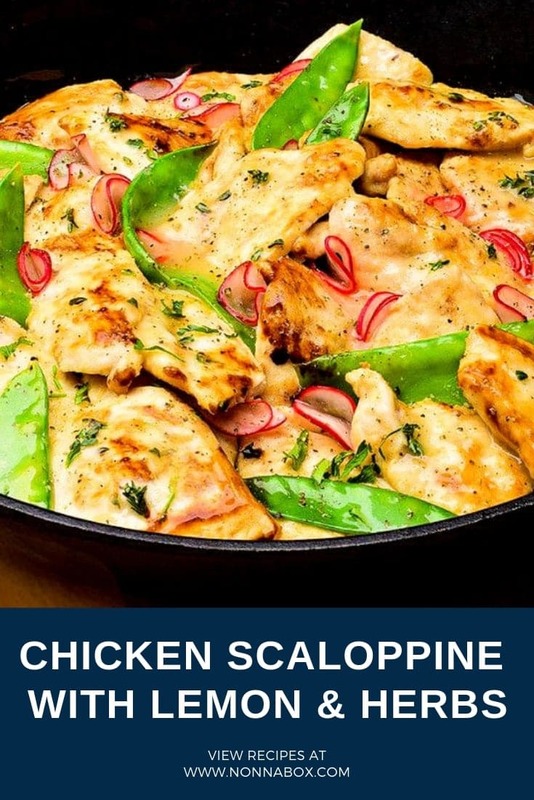 For this deliciously moist and tender Italian classic, thinly pounded slices of chicken are dredged in flour, briefly sauteed, and served in a flavorful lemon herb sauce. Fresh ingredients and careful handling of the chicken are the secrets to this dish–pound the chicken to a quarter of an inch and make sure not to overcook it, or else you may end up with rubbery meat. Although chicken scaloppine is popular in the U.S., the dish is more commonly made with veal in Italy. Turkey and pork are also frequently used. In addition to different types of meat, this variable dish can also be prepared with many different sauces, such as Marsala wine, tomato, balsamic vinegar, mushroom, or olives. This recipe uses a bright lemon and herb sauce. Whichever ingredients you use, the result is thin, tender slices of meat smothered in a generous amount of flavorful sauce. Serve your chicken scaloppine with warm, crusty bread to soak up the extra sauce and a green salad or fresh tomato salad. Enjoy! Typically made with pounded veal cutlets, scaloppine hails from northern Italy, where the recipe has become famous. Boil 2 cups of water and blanch the snap peas for 2 minutes. Transfer to a bowl of ice water and set aside. Cut chicken cutlets into 2-inch by 1-inch pieces. Pour flour onto a large plate and season with salt and pepper to taste. In a 12-inch nonstick sauté pan, heat the butter and olive oil over medium-high heat. Sauté the chicken in small batches for 2 minutes on each side. Add the lemon juice to the pan to thicken the sauce. Bring to a light boil and simmer for 1 minute. Add the thyme and parsley. Remove from heat, transfer to a serving platter, and pour the sauce over the chicken. 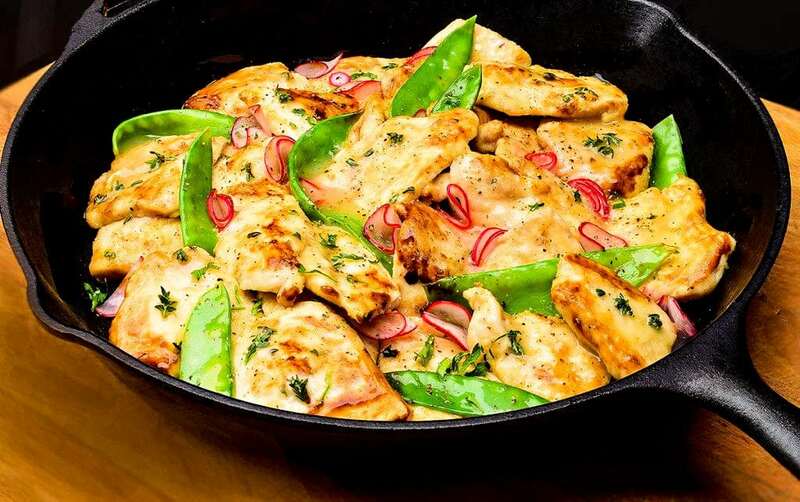 Add the snap peas and radish slices to garnish, and serve hot with warm, crusty bread.